Posting after a break need a big push-up, really...I am on vacation and posting in mid of that. Want to know the reason of this excitement? I am on vacation in North India and in any restaurant we visit this dish is must there. It is very new to me and fell in love with this dish. So, I had to try my hands on this dish at home..I found this dish on net and after few days I surprised my family with this dish in dinner, who also loved this very much. Dhingri Dolma is an Awadhi/Lucknowi preperation. 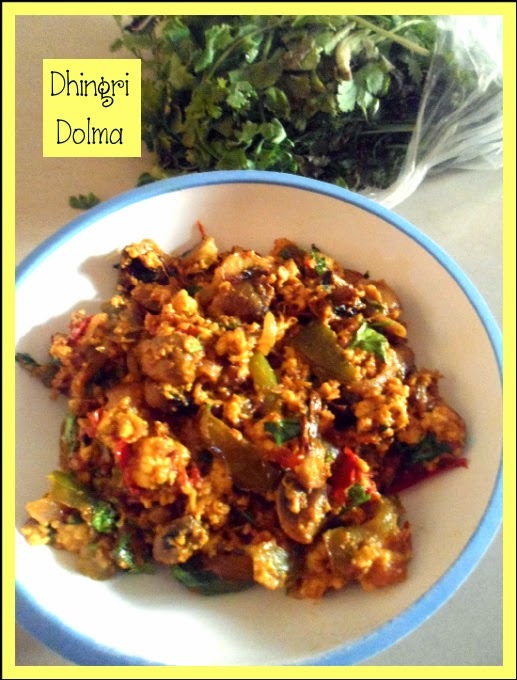 the two main ingredients are Dhingri or Mushroom and Paneer(indian Cottage cheese). It's nothing complicated, but amazingly very simple and easy-to-make recipe and superbly delicious with Indian flatbreads. It needs very few spices. This dish is quite colorful where mushrooms and grated paneer are tempered with Shah Jeera(caraway seeds) and cooked with tomatoes. If shah jeera is not available, can substitute with white cumin seeds. Shah jeera is thinner and darker than regular cumin seeds and has a very distinctive aroma. It is often used in Mughlai/Lucknowi Cuisine. To make this dish more colorful and healthy and knowing bell pepper combines very well with mushroom and paneer both, I added few capsicum/bell pepper pieces, which made this dish more delicious according to my taste. So without much ado, sharing the recipe with you all and I'll recommend every viewer to try this out, even who hates mushrooms. Shah-jeera/cumin seeds : 1 tsp. White pepper powder/black pepper powder : 1/2 tsp. Wash the mushrooms and dice them. Chop the onions and tomatoes. Crumble the paneer very finely. This is very important for the texture of the dish. Heat oil or ghee in a pan, add shah-jeera or cumin seeds, fry till it crackles, then add onions. Fry till they have just changed the color, immediately add ginger-garlic paste and chopped green chillies. Mix well with the onions for a minute or two, then add diced mushrooms and stir fry them till mushrooms turn light brown for 2-3 minutes. Now add diced capsicum/bell pepper and stir fry again for 2 minutes. Now add turmeric, red chilli powder, white/black pepper powder and mix well. Saute for 2-3 minutes, till mushrooms and bell peppers are almost cooked. Then add crumbled paneer and mix well with rest. Now add tomatoes and stir fry to cook the tomatoes. Do not let them mash. Finally sprinkle some garam masala powder and 2/3 of the coriander leaves. Mix well. Season with salt. my favourite combination, now I am craving for some, but no mushrooms available at the moment. Lovely recipe.